Spinning and twirling are simple in and of themselves, but they require your dog to understand the difference between turning one way and turning the other way. Basically, you want your dog to turn in a small circle in the direction you tell him to, on cue. I use “spin” for counterclockwise (in the opposite direction from the way the hands of a clock turn), and “twirl” for clockwise. Other possible cues are “twist” and “turn.” Start by teaching spin. Get some treats and your clicker and have your dog at your left side. With a treat in your left hand, lure his head so that he turns away from you, toward his left. When he has turned halfway, click and praise him for doing such a nice spin. Repeat several times. When you’re sure he understands, use the treat to lure him all the way around, so he’s made one complete turn. Repeat until he really gets it. Now try giving a partial signal with your hand, not luring him the whole way around. If he spins all the way, click, treat, and have a big celebration. You can now gradually wean him off the lure. When your dog is spinning reliably, you can add your verbal cue, such as “spin.” Tell him to spin, and then, when he does, click and treat. Remember to reinforce only when he spins on your cue, not if he just spins at random. At ﬁrst you may need to help him out with a ﬂick of your left hand in the correct direction, but eventually he should be able to spin with just the verbal cue. Next, get your dog to spin while facing you. Stand in front of your dog, signal with your left hand for him to turn counterclockwise, and give your verbal cue. He already knows the behavior and now is just learning it in a different setting. At ﬁrst he may need help because he’s facing a different way. But with a little practice, he will get it. Continue practicing until he can spin counterclockwise with, at most, a ﬂick of your ﬁngers pointing him the right way. Now you can teach twirl. This time, have your dog on your right side when you begin. Lure his nose out away from you so that he is turning in a clockwise direction (the same way the hands move on the face of a clock). Click while he is turning. Repeat several times. When he is turning consistently, you can add your cue word. Then you can gradually wean him off the lure until he can twirl on his own. As with the spin, step in front of your dog and help him twirl. As he gets more conﬁdent, you can once again wean him off the lure until the most you will need to get him going is a ﬂick of your right hand in the correct direction. Once he knows both spin and twirl, you can begin asking for either one when he is in front of you. At ﬁrst he will be confused, but if he goes the wrong way, just help him do it right before you give him a treat. For example, if you say “spin” and he goes in the direction of “twirl,” don’t give him a treat. Be sure to reinforce him only when he does what you asked him to do. Also, don’t always alternate which way you ask him to go—mix it up a bit. This will keep him paying attention! 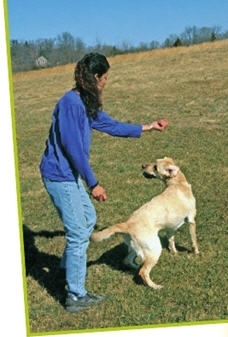 You can also teach your dog to spin and twirl from a distance, which adds another layer of difﬁculty. Start out small by placing a target a foot or two away. Send him to the target, then tell him to spin or twirl. If he does it correctly, go to him and give him a treat. 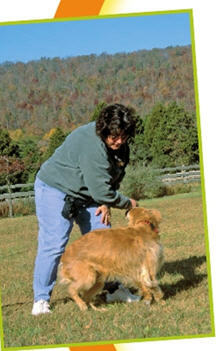 Increase the distance gradually, and remember to move the target a bit closer if your dog is having trouble. In the beginning, you will probably have to use some hand signals as well as your verbal cues. But as your dog grows more conﬁdent, he will be able to spin and twirl on just your voice cues.